drawers" as they were then termed—a class of article which, says Heppelwhite, " admits of but little variation " ; yet the "serpentine" front of the first, the graceful "sweep" of the second, and the shaping of the lower part of the cases of both, impart a distinct charm and individuality to them which at once raises them above the commonplace. With Fig. 9 we return to work of a more ornate character. This "commode," as it is styled, is classed in Heppelwhite's book under the heading " Dressing Apparatus," but, in his description of it, the designer states that it is " adapted for the drawing-room," and explains further : " Within are shelves which answer the use of a closet or cupboard. It may have one principal door in front, or one at each end ; they are made of various shapes, and being used in the principal rooms require considerable elegance. 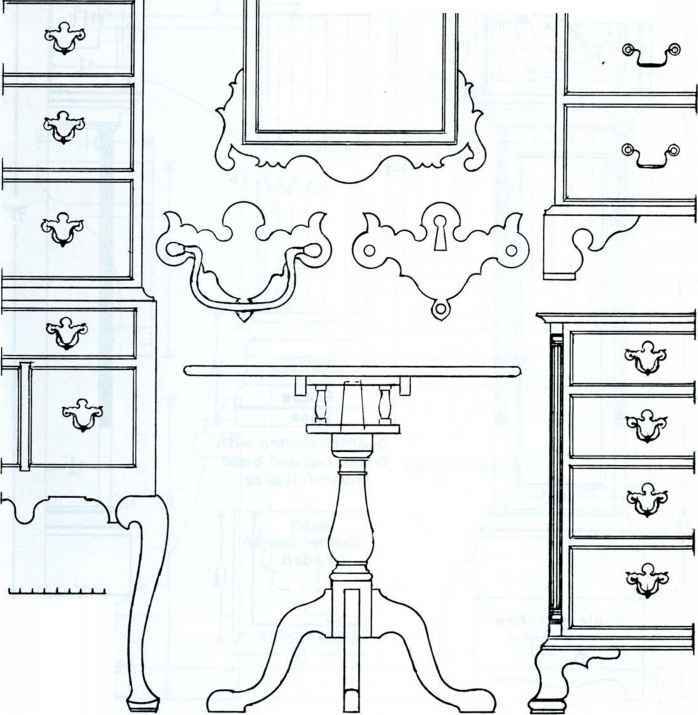 The panels may be of satinwood, plain or inlaid ; the top, and also the border round the front, should be inlaid. The tops of these are frequently inlaid or painted work." It must be obvious, then, that this piece was never intended to play a part in the operations of the toilet, notwithstanding the place it occupies under "Dressing Apparatus."